Timecards help you manage your employees – both their total hours worked and revenue per working hour. With these tools, you can view performance insights for all your employees. Learn more about creating and managing timecards with Square. From your online Square Dashboard, you can modify timecards, view and export time tracking reports, and clock employees out if they forget. Below is a rundown of the Timecards section of your dashboard. Your timecard reporting is displayed by workday. In this tab, you’ll see s single day’s worth of employee activity. This includes every shift started within the selected workday, breaks, and whether any shifts for that day included overtime. From the timeline, you can view, create, edit, and delete shifts. Use the date and location filters to find the shifts you’re looking for. The timeline shows you shifts a workday at a time. Note: Scheduling shifts is not available with Square Timecards. The timeline is a visual representation of shifts created in the Square app and online Square Dashboard. Visit the Workday section of your online Square Dashboard > adjust the date and location filters to find the shift you would like to view. Locate and select the shift. Here, you’ll see total hours worked in that shift, paid hours, and labor cost. Visit the Labor Cost section of your online Square Dashboard > adjust the date and location filters. Select a timecard to view its details. Click Export Shifts to download a .CSV file of the report for that employee. Visit the Workday section of your online Square Dashboard > adjust the date and location filters to find the shift you would like to edit. Adjust the shift details such as clock in/out time, breaks, and jobs worked. Shifts that go into overtime and doubletime are marked in red. To view and adjust overtime settings, as well as find information on overtime rules for your state, go to Settings > Overtime & Breaks. Review total hours and labor costs necessary to pay your employees. If your employees are working multiple jobs at different wages, overtime will be calculated using the weighted average of the total normal earnings divided by total hours worked. Regular Hours: Hours worked at an employee’s wage according to their job title. Overtime Hours: Defined by your state’s rules, overtime hours are typically paid at 1.5 the employee’s hourly wage. Doubletime Hours: Defined by your state’s rules, overtime hours are typically paid at 2x the employee’s hourly wage. Paid Hours: Total paid hours for the selected date range. Total Labor Cost: Total labor cost for the selected date range. Note: Overtime for employees with multiple wages is based on the employee’s blended rate. A blended rate is the weighted average of the total normal earnings divided by total hours worked. For compensation, the employee is paid .5x this rate for their overtime premium. Click Export Shifts to download a .CSV file of the report. With Square’s Labor vs Sales reporting, you can compare your hourly labor costs to your net sales in one report. 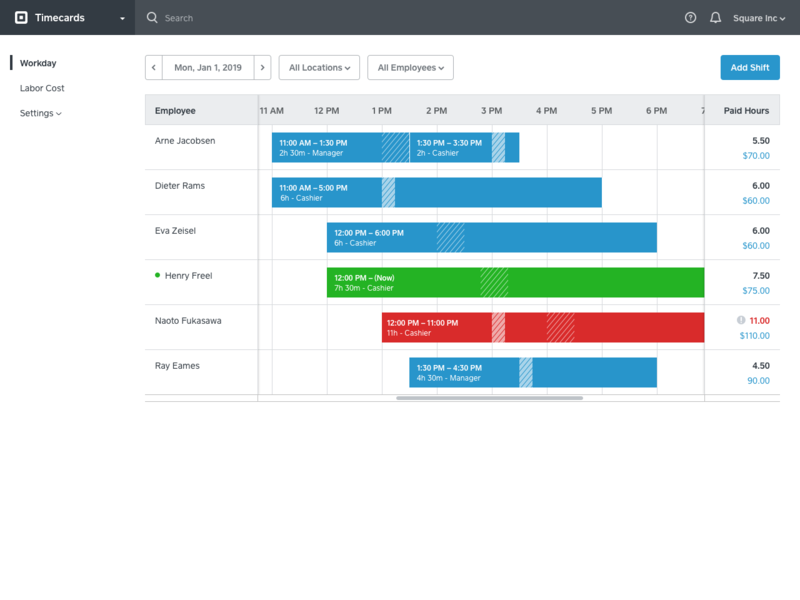 When you’re able to compare your cost of labor with your sales, you can make smart business decisions in a snap – like optimizing your staffing schedules to ensure that the right number of employees are scheduled for peak times. In order to use Labor vs Sales reporting you must be subscribed to Employee Management, and your employees must have a wage assigned to them. Visit Reports > Labor vs Sales in your online Square Dashboard. Filter your report by day, week, month, employee, or location. Click Export to download a .CSV file. Note: Your employees will need to clock in and out for a few days before there is enough data for the report. Timecards that were created prior to adding wage information to an employee will not populate retroactively.